Replace costly and time-consuming manual inspections and reduce expensive field repair and replacement with this system that identifies surface defects on steel plates. 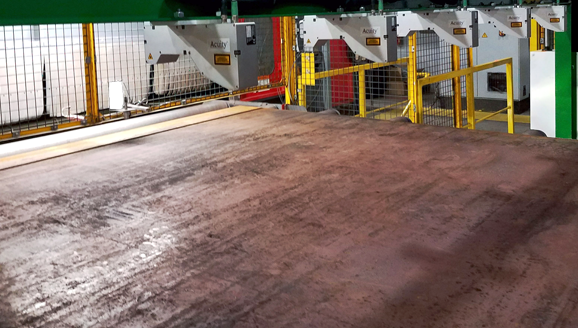 The Artemis Vision Steel Plate Surface Inspector verifies that steel plate surfaces are meeting or exceeding applicable standards (including MILSPEC, ABS, ASTM) across plates as wide as 13 feet and thicknesses ranging from .1875″ through 4″. Using a configurable array of highly tuneable lasers, accurate to .0039″ (0.1mm), the system is designed to operate and withstand the most demanding and harsh environments. The inspection system scans one or more sides of steel plates to detect surface defects such as pits, corrosion, cracks, flakes, and porosity. This is a turn-key system that delivers raw inspection data as well as configurable alarms and reports across varying time-frames and platforms. Capabilities Detects defects such as pits, corrosion, cracks, flakes, porosity. Footprint Base model featuring 5 lasers: 6 x 14 feet. Units can be scaled up or down to meet requirements.